Day Five: St. Petersburg = Venice + Boston + ??? Let me start with the punchline. St. Petersburg is a beautiful, sophisticated and culturally diverse city. It is like a number of places, yet unlike anyplace. This was our second visit to the city. Thanks to the intelligent and articulate Maria, a few adventurous side trips with my Brit buddies, a memorable dinner with two locals at their apartment, and some notable miscues, trip two complemented trip one quite nicely. Day five was a simple affair. Guide Maria drove us to some of her favorite stops, and gave us some background. In my case, I was able to re-explore some familiar sights. You know how it is when you visit a place for the second time. Our first scheduled stop was the spectacularly beautiful Church of Spilt Blood, where somebody killed somebody (sort of a historical tradition in Russia). It was a rare, clear sunny day, the canals were in full view, and quite busy. 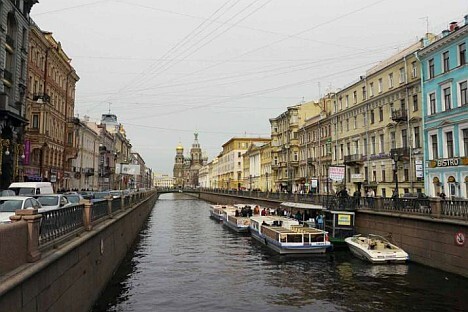 There are 26 canals, maybe more, in St. Petersburg proper, that why some call it the Venice of the North. Virtually every canal is lined with European style buildings, and within walking distance of great shopping and numerous yummy eateries. The Church of Spilt Blood, which may be the most spectacular Church exterior in all of Russia, if not the world. It took the city almost 15 years to lovingly complete it’s most recent restoration. Last time we visited, the Church was wrapped in scaffolds, wires and such. So it was a real treat to see what we had only imagined. It was now late afternoon, and I had to get ready for my evening dinner engagement, arranged entirely via Skype and email. A number of people had commented that the Russian translation of my book, Call Sign, White Lily, needed some contemporizing. Since I don’t read or write Russian, I had to leave it to the experts. Through a series of connections with the Russian Cultural Centre in Washington D.C. and Memphis, TN, I had been introduced to a frequently published Professor Valentin Sapunov well known around the word for his work in establishing the physiological genetics of adaptive microevolution as branch of biology (I have no idea what that means, except he’s really smart!). Turns out, Valentin’s father, Boris, is no slouch either— he was a PhD, has been historical director of the Hermitage for 30 years, and owned an honorary doctorate from Oxford, in addition to publishing 15 or 20 books. I made a trip to the front desk where I had befriended a nice young clerk who spoke perfect English. After pursuing a street map, he wrote a note in English and Cyrillian with the directions for the cab driver. “Best to be certain. Never know.” Since I knew there was no chance the cab driver spoke English, I thanked him for the Cyrillian translation. At the time, the “never know” comment had no significance. I handed the driver the paper. He nodded and away we went. 20 minutes later we were somewhere in St. Petersburg. Nice neighborhood, nice apartments, a few local shops etc. He pointed and let me out. I assumed that was Valentin’s building. As he pulled away, I realized everything was in Cyrillian. I couldn’t even figure out which apartment to ring. I remained calm while calling Valentin on my cell phone. He asked where I was. I described the building. At this point, I was tired, frustrated and need to take a giant pee! Valentin suggested we walk the neighborhood so I can see the University, and some local points of historic. He was so proud and passionate, I couldn’t say no. 30 minutes later we were tummy-to-tummy in a one person elevator heading for his 5th floor apartment. “Tight even when carry grocery,” he laughed. The apartment was surprising large for a man and his father, had tall ceilings, wooden floors, and 39 ancient appliances and bath fixtures. No matter, it clearly felt like home. Both men were warm and kind. Valentin had prepared multiple courses, staring with some Vodka and snacks. We talked, ate, drank and laughed for hours. Even Father, who only spoke Russian, seemed to understand. Father also volunteered to add an endorsement to the front of the book. I told him I was honored that someone so well respected would do that for an American. Valentin translated what father said, “Is it not about time we understand each other better? Your book can help.” I proudly nodded “da.” Valentin and I now communicate regularly, and his journalist friend is working on the translation that I dream will one day be published and broadly distributed in Russia. It was now time to go. Wisely Valentin did not suggest a Metro. He called a cab. When the cab arrived, Valentin explained in Russian where I wanted to go with great precision. How did I know that? The cab ride was 400 rubles rather than the 600 on the way over, and I got back to the hotel in about 15 minutes. I thought about having a celebratory drink in the bar with me, myself and I, but it was as quiet as a church, so I assumed the place had or was about to close. So I went up stairs, sat on the bed, and reflected on my amazing day. When I chose to write Call Sign, I had no idea the experience would change my life forever. I am on a journey to an unknown destination. What an adrenaline rush! The story and the trip is sponsored by Russian-American Consulting Corporation (RACC).